This article was first published on July 23, 2013 on Atlantic Council's Egypt Source blog. Funeral of the two martyrs Mohammed El-Guindy and Amr Saad. The most interesting aspect of the mundane debate over whether what happened between June 30 and July 3 was a coup or a revolution is the debate itself. Irrespective of the definitions of these words, the debate acknowledges two simple facts. Revolution is good, coup is bad. This is perhaps the one point all parties involved in the debate can agree upon, namely the Muslim Brotherhood and its supporters, the military and the people against the Brotherhood. The army wants to avoid the term coup for international considerations and to reinforce its own legitimacy, while anti-Morsi protesters want to avoid it because it denies agency. The Brotherhood, on the other hand, uses it because it implies theft. Brotherhood apologists adhere to a list of talking points they believe demonstrate what happened in Egypt is the theft of power: Morsi is a democratically elected president, and therefore removing him was unconstitutional and illegitimate; a democratic government was overthrown; Mubarak-era figures, the media, Egypt’s Christians, Shi’ite Muslims, the United States, Iran, all bear responsibility for Morsi’s removal. While it is easy to pick apart each of these points, it adds little value to an endless debate. I do, however, have one answer to any doubts or questions, one answer that is worth sharing. That answer is Guindy. Mohamed al-Guindy was kidnapped by the police after appearing on a news channel denouncing the Ministry of Interior for its excessive use of force against anti-government protesters. He was taken to a Central Security Forces (CSF) camp and tortured to death by the police, in the alleged presence of Muslim Brotherhood members inside the camp, who helped torture other detainees. Guindy was tortured, turning up later at a hospital where he spent a week on life support before succumbing to his injuries. According to the medics, he died of a brain haemorrhage. His ribs were broken, there were signs of electrocution on his body, and even his tongue was bruised from torture. The story doesn’t end here. Ahmed Mekky, then-minister of justice and a Brotherhood loyalist announced that the autopsy report showed his death was the result of a hit-and-run accident. His statements were made before an official report was issued. Later, Mekky confessed he only did so because the minister of interior told him to. 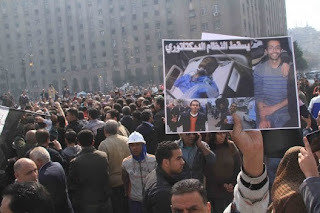 The state attempted to cover up Guindy’s murder, his case resembling that of Khaled Said, whose death at the hands of Egyptian security forces is said to have ignited the Egyptian revolution. Guindy’s death is not, however, an isolated incident. Jika, Kristy, Al Husseiny Abou-Deif, Amr Saad, Mohamed al Shafie, Omar the sweet potato seller and many more, were killed during Morsi’s rule. Any hopes for security sector reform were forgotten, as the Brotherhood-led government cracked down on opposition, using police brutality to serve their agenda instead of delivering justice. Guindy is but one name, one face we know of, but Morsi’s state produced many Guindys. The Brotherhood government tried to takeover relics of the Mubarak regime, and make these failed institutions their own. It seems odd that the Brotherhood were trying to resuscitate a system, which was not only responsible for their own repression, but had failed miserably enough to elicit a revolution. Morsi came to power with the promise of building democratic state institutions, which he failed to do. Egypt never matured into a democracy with formal channels to prevent the power-grab of a dictator. Meanwhile the West is stuck in their moulds of democracy and ballot boxes, as they seem to have forgotten how they got there. They forget that a framework ensuring rights and democratic institutions must be in place before relying on the ballot box. A coup can bring about disastrous results; just as a revolution can bring religious fascism to power, as was the case in Iran; just as the ballot box can bring a Liberian warlord like Charles Taylor to power. The only questions that matter are: What state is Egypt in? How close is it to genuine democracy? And how do we bring it closer? Democracy ensures that minorities are not oppressed. A democratic state does not witness verbal incitement against Shia’a citizens, in the presence of a president who does nothing to stop it. A democratic state does not witness this incitement escalate into the lynching of four people a few days later, and no one is brought to account. I agree with Morsi’s supporters that he should not have been removed on July 3. He should have been removed much earlier. He should have been removed with the first unpunished torture or death that was never properly investigated: Jika, Guindy, Kristy or any of the dozens that have been killed and the scores tortured. He should have been removed with his first attempt at taking over state institutions instead of fixing them. He should have been removed with his first attempt at subverting democracy. To all the questions about coup or revolution, do labels really matter? It’s an irrelevant question, because a revolution is more of a mind-set than a single isolated event. It’s like asking whether a car is metal or plastic. There’s only one revolution, and within it are changes of government, people, alliances, but most of all a change in power dynamics and the way of life. I don’t know what the right questions are. I don’t know how democracy should be built or how state institutions can be fixed. I don’t know what we really need or how to put the right people in the right place. I only know that the right answer is Guindy. I know that the only tears worth shedding are over those killed brutally for no reason, not Morsi or his proclaimed legitimacy. As long as citizens are targeted and killed and their killers continue to rule, we should exert every effort to bring about justice or remove them. Perhaps this revolution will truly succeed when we have no more Guindys to answer questions with.